The LWVGB has long held that adequate public transportation is a vital element in the well being of any urban area, impacting on land use, economic development, air quality, employment opportunities, and mobility for all citizens. 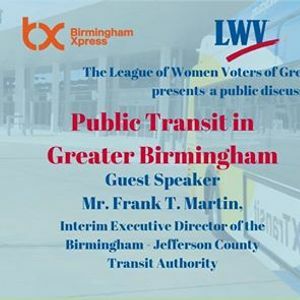 On Tuesday, March 26, join us for a conversation with Birmingham - Jefferson County Transit Authority (BJCTA) Interim Executive Director Frank T. Martin as he gives us an update on the public transit system in the Greater Birmingham area. We will meet 6:00 - 8:00 p.m. in the BJCTA administration building at 1801 Morris Avenue in downtown Birmingham (east across 18th St. from the Intermodal Transit Hub.) 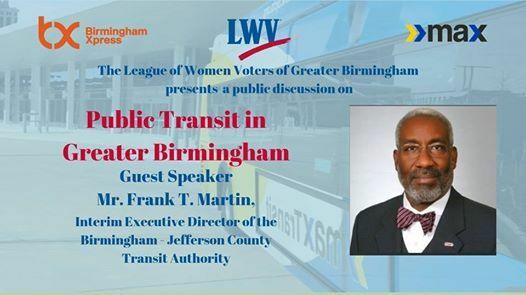 We look forward to hearing from Mr. Martin about the current status of the transit system in our community, projected goals of the BJCTA, and how can we support efforts to make the public transit system better. This program is free, and the public is invited to attend.